These cute save the date cards are a very simple and you can make them from the comfort of your own home. There are two tags. One tag has a photograph of the happy couple on one side and typed details on the other. The second tag has a cute picture of a plastic bride and groom. You can find many pre-made tags from stationary stores, craft stores, scrapbooking shops and the like. Or if you are feeling super frugal and have the time you can cut your own from cardstock of your choice. 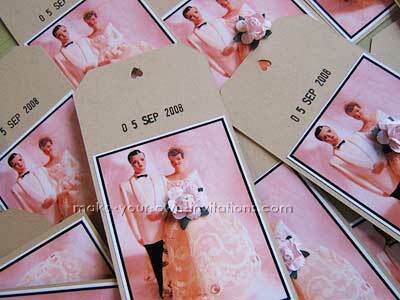 Find a photo of the bride and groom to be and print off as many as you need. You can create a word document and insert several images to cover a whole sheet of paper, just make sure that the photo will fit on the tag. Print in black and white onto white cardstock or regular copy paper. Glue the photo to the tag with a glue stick and trim the edges. This picture is a photo of the actual cake topper that will be used on the cake. You can use any photo you like. Grab one from a stock photo website and print off however many you require. A small craft flower was adhered to the photo where the wedding bouquet would be. You can purchase one of these stamps for a few dollars from a stationary store. They are like the old stamps the librarians used to use to stamp the due date back in the olden days before barcode and scanner systems. Very retro! Create another word document for your details. Measure a rectangle so that they will fit nicely on the tag and type up all the information. Print, cut and stick. Punch a hole at the top of the tag. If you have a heart shaped hole punch then use that otherwise a regular round hole punch will have to suffice. Thread the two tags onto a length of ribbon and tie off. 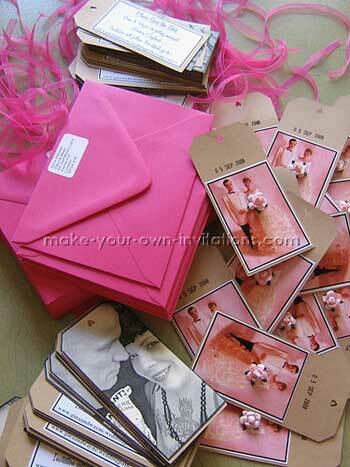 Tags are great for making any kind of card or tag because they are nice and small and easy to fill. If you run out of room on your tag then you simply add another to the mix. Make a single tag and glue a small magnet to the back so your guests can stick your reminder on the fridge. Make a tag for each word 'save' ''the' 'date' '12 dec 2010' . Thread a bunch of different ribbons and fibers to hold them together. Try tags of different shapes and sizes.